If you buy from new you can have it made to your specification and also opt for no, small or large knee rolls. 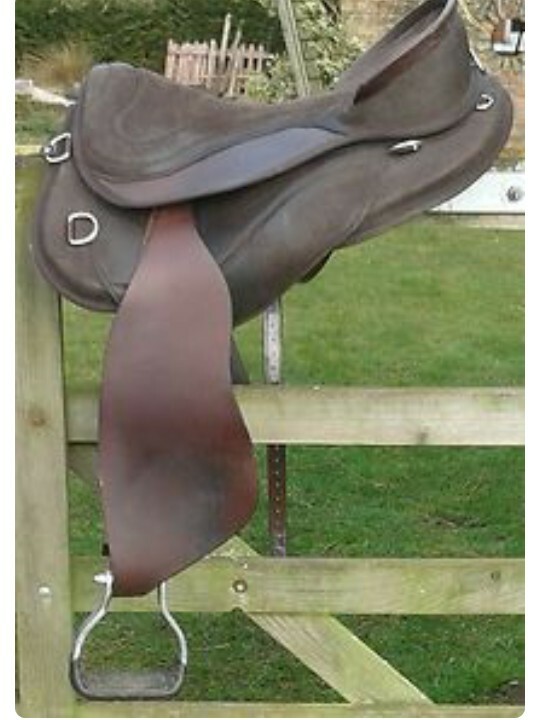 These are lovely looking saddles, not seen in the flesh so if you have one, get in touch. have two horses and they each have Freeform saddles. My little mare is 13.3, approx 360kg, and she would be best described as a light-weight cob. She has small withers, but does actually have withers!! Her freeform is a 16″ seat on the smaller version of the classic base, and it fits us both perfectly. I can mount from the ground if I have to without it slipping, and it doesn’t slip when we do extreme up- or down-hills either, nor when she does her occasional daft spooks!! She wears it with a Leather Airnet elastic girth. We’ve done Trec, a bit of dressage and LOADS of hacking it, and she’s had it since 2003. I find it an incredibly comfortable saddle and I believe she does too. My bigger gelding is a 15h 500kg barrel shape with no withers at all. He’s had his Freeform since I first bought him in 2004 and at that time he was around 620kg and loaded with fat pads! We’ve done some serious ‘dieting’ every year because his diet really has to be controlled to keep him at a weight more suitable to him, but his saddle has coped with all his weight changes. He’s got a standard size classic base with a 17.5″ seat on it, which used to fit me better because I too was a ’round’ person, although I’m not now, and I now find the seat a little too generous. He and I do Trec, dressage and a bit of jumping along with loads of hacking, and the saddle is fine for all these activities. He also wears a Leather Airnet elastic girth and I can mount from the ground on him too on my more agile days (well I am 50!) if I have to, without the saddle slipping. He is often ridden by friends who haven’t got a horse and who accompany me and my mare, and everybody comments on how very comfortable it is. The quality of the leather is lovely, and in fact the quality of the saddle is super all round. I don’t think I’d ever buy a different make for wither of these two horses now – we love our Freeforms. This is a standard 22″ base freeform elite dressage saddle. Cutback 3cm with suede underside. This saddle offers large supportive knee blocks and a higher cantle than the classic models and a more defined twist in the seat. I found this more comfortable for me than the classic as I prefer a large knee block to support my leg,my left especially due to an old knee injury. I was effortlessly put into a very nice position and felt secure and balanced. The horses I used this on all moved freely and offered canter with a smooth transition which has been a struggle in their treed saddles. I think on Parr the lack of tree and the ample shoulder room this model offers were both contributing factors. It has a firmer feel than the sensations for example and is not quite so malleable but still offers flexibility. The stirrup plate is movable by simply taking the seat off and adjusting. All in all a lovely saddle with a great deal of flexibility,and also show worthy for the competition ring. 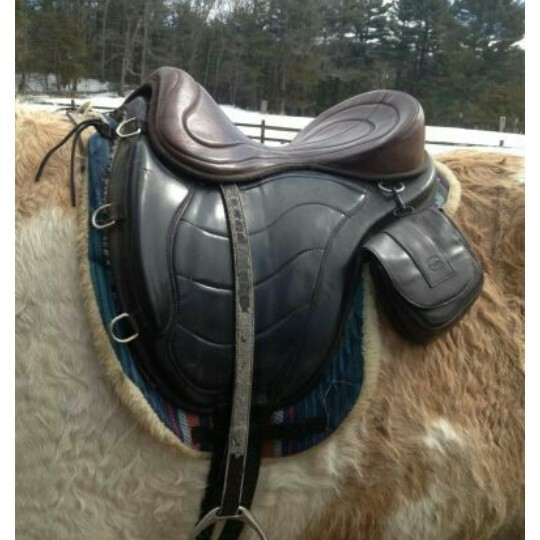 The picture is a 14hh gelding and the saddle really only just fits,the 20″ short base would be better for him but I was just testing this out. This is Ellie in her Freeform saddle with red equitex pad underneath. She is a medium wide to wide in a treed saddle. The one I bought was the dressage Freeform as I felt it fitted my length of legs (I am only five feet tall) and with Ellie’s movement I thought it was the better choice. If the horse is smaller than 15 hands I think the person should ask to buy the shorter backed option. Ellie is short backed and I think I could have got away with a shorter backed model. Have tried the saddle on a Irish X but it fitted across the shoulders but did not sit on his back. Have tried the saddle on a Thoroughbred with a high wither and we were not convinced but my friend said she would like to try it out riding with the equitex pad underneath. Ellie is very happy in the saddle and in fact she does not take a step backwards now when you get off. It’s extremely comfy for the rider. i’ve been testing one of these this week, i’ve decided to buy one. I found straight away the seat slippery to what i’m used to and the seat had a shape. I’ve got a Libra Trec. However i decided that i could change the seat to suede or pop on seat saver. Plus i’m not used to the seat shape. So chances are it’s due to how i sat. Met up with friend and went for plod, did fit in two canters and i found it easy to ride in the forward seat just as easy as sitting. Jack being Jack spotted open gate and thought lets really test it out, i said no and we spun round, the saddle didn’t move. It didn’t slip it didn’t go forwards either. Excellent plus point, think decided then i was going to get one! Due to Jack’s shape and fact he does have history of spinning, can stop dead and the Freeform didn’t budge. Friend liked the saddle said suited Jack. He liked it, I liked it. Day two, this time I shortened the stirrups a few holes as spent some of last hack with them in mid flight. I also rode in my suede full chaps as i found the seat a tad slippery, this is likely to be due to fact i’ve had my derier on suede and synthetic suede, I think it’s a mental thing that i think i may just slide off, I’m also finding the seat a little small for me, but I can order the Classic Plus seat. The stirrups are set forwards at the moment and so i was doing sort of western seat, i did pop over a small jump to see what saddle felt like and it was comfortable. I changed from the pad it came with to my equitex pad, to see how it felt, it felt insecure, so changed back to the Haf. This model is the sb, with 20″ base, i would get the synthetic suede model. I also liked the girth system, my chap has a slight forward groove and the girth sits nicely with this saddle, i’m using a roamer girth and I do have a trekker one. By day four i was finding the seat plenty big enough as my body had adapted to the shape. I did some small gridwork 2ft4 and i loved the feel and felt secure. I’d even forgotten the seat felt slippery, which it didn’t seem to feel anymore.